The Cushing Cottage is on a 17-acre private property three miles from the Battlefield and four miles from downtown Gettysburg, providing a beautiful, peaceful setting for your relaxing get-away. Cottage has screened porch to enjoy solitude for everything from your morning coffee to your evening recollections of time spent on the battlefield, downtown stroll, or at the many special events in Gettysburg, such as the Reenactment, Remembrance Day, and the Bluegrass Festival. This will be your quiet country retreat. Your screened porch will be your oasis. The cottage is even better in person then in the pictures. Chris and Todd are very welcoming and make you feel at home. The property is lovely and can't wait to go back when it is warmer. My husband and I spent the weekend of my birthday and they made it special. The chickens wandering around the yard and coming up to you when they see you was cute. Thank you so much and we are so happy you enjoyed your birthday getaway!! We look forward to seeing you again! The cottage was very cute and great location. Everything was fine. Our only complaint was the bed was very comfortable. It was two twins pushed together to make a king. That was a little disappointing to use for my husband and I. Otherwise the place was very nice and it was nice that it was stocked with cheese, food and drinks. I tend to be somewhat wary when a place gets nothing but 5-star ratings, but Cushing Cottage at Brierfield absolutely deserves it! Far enough away from town that you have to concentrate to hear sounds of technology (like car engines) but close enough that you can get there in 10 minutes. Cottage is perfect; fridge was stocked with water, pop, cheese...even a bottle of wine! Chris and Todd live next door, so they're available if you need anything. We didn't...everything was perfect! Thank you!!!! We appreciate your review and hope to see you again! Wonderful cosy cottage in the countryside near Gettysburg. 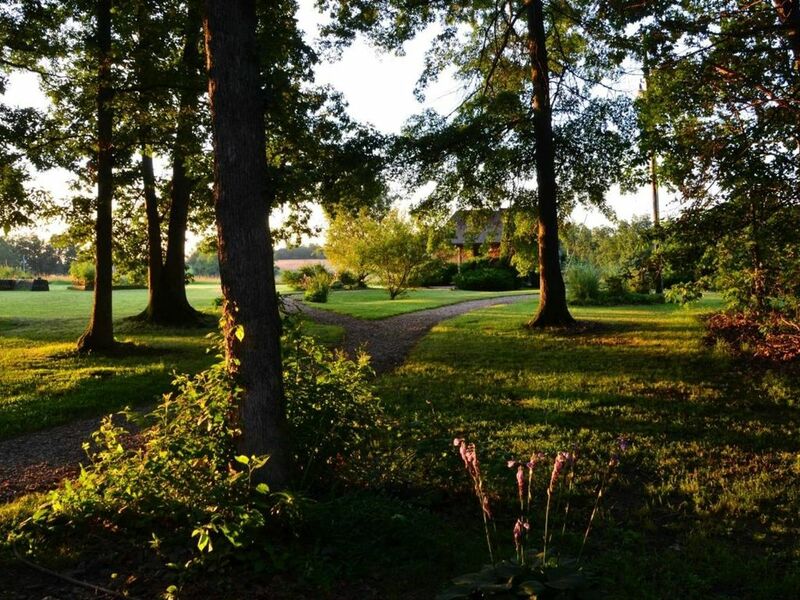 These two lovely cottages are secluded and quiet in the countryside outside of Gettysburg. We chose Cushing cottage for the king bed, which was very comfortable. Furnished with antiques collected by the mother of owner Chris, this high-ceilinged and spacious cottage is clean and fresh and up to all modern standards, and she keeps it well stocked with all sorts of amenities, incuding a welcome bottle of wine, crackers and cheese, chips, pastries, juices, water bottles, and breakfast sausage and egg biscuits in the freezer ready to heat up in the microwave, as well as a coffee maker. The toiletries are high quality and a hair dryer provided. When I requested a toaster, she provided one for me. I told her we would get in very late at night and when we arrived at 2:00 am not only was the cottage heated and ready for us, with the lights on, providing a cheerful welcoming aspect for weary travelers, her charming husband Todd even came over to check that we had everything we needed. They both couldn't have been nicer throughout our stay. Truly warm, gracious and kind people. In the morning we were charmed to watch their beautiful chickens, wandering their wooded property, scratching for food and softly clucking in a sort of gentle murmur. Later we met their sweet dogs. We enjoyed having access to the bustle of Gettysburg and then retreating to this peaceful oasis again. I grew up around the corner from this property, which is why I chose it for my return visit decades after I moved to California, but we loved it so much that we plan to return more regularly and wouldn't stay anywhere else now. It will be our home away from home in Gettysburg from now on! It really is a bargain at the price and I would give it a sixth star if I could. We truly enjoyed your visit and feel we have found new wonderful friends! Thank you for the detailed review and kind words. Already looking forward to your return ! Wonderful little cottage. Feel like you're in the middle of nowhere- rolling farm land and trees. Only 4 easy miles to Gettysburg. Would love to have stayed longer. So happy you enjoyed the property! Thank you for your review ! Three miles from the Battlefield and four miles from Gettysburg Square.